Lurking alongside the Christmas displays at Garden Centres just now, you will be spotting bird table displays as a possible gift to ourselves or for others (great idea btw). 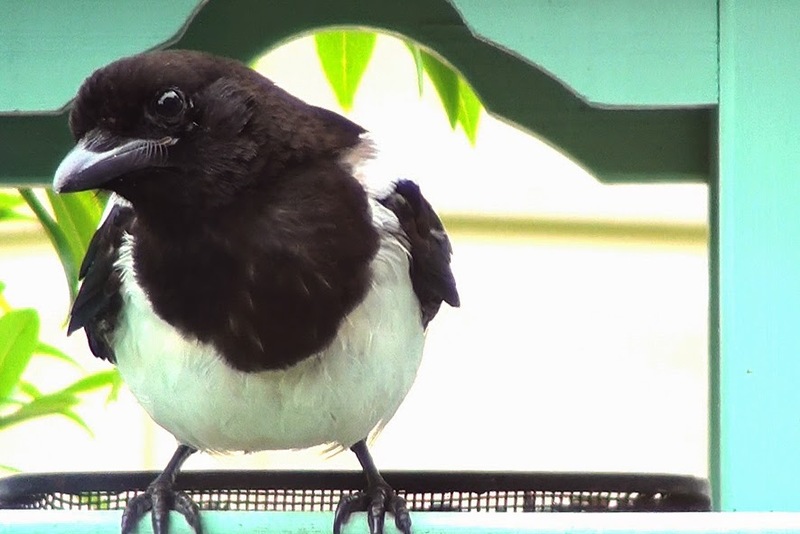 The reality is that birds do appreciate tables and feeders stocked with food being available all year round, especially during their busiest time of year (the breeding season) when you might not spot visits until they bring in their noisy, newly fledged young. Due to their height, as with tall plants, bird tables can make a bit of a statement in the garden. It can be appreciated that not all gardens have the space and not all gardeners have the desire for a bird table in the design they have created. Pre gardenwatching I might have been in the later camp but not now. Winter visitors of passing Blackcaps have been my bird table highlight so far but the usual suspects entertain all year round! “A quiet location with a good view from the house is normally the best place for a bird table. 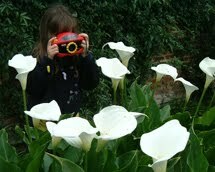 This allows you to enjoy observing the garden birds while they feed with little disturbance. 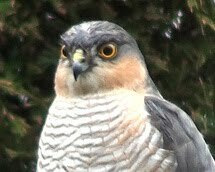 I’ve had a pretty special, garden feature of a bird table in my garden for almost a year now. 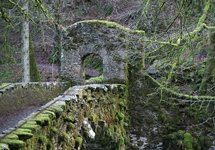 I offered to review it as I thought it would look great during the dull winter months – but would I keep it in the same location over the summer? Agreeing with the last point in the RSPB advice above, I was nervous about the idea of moving my bird table when the birds seemed happy to use it where it was. However, during the summer months more walking access was required to the right of the bird table going to my greenhouse and potting shed. Both the birds and I have been happy! 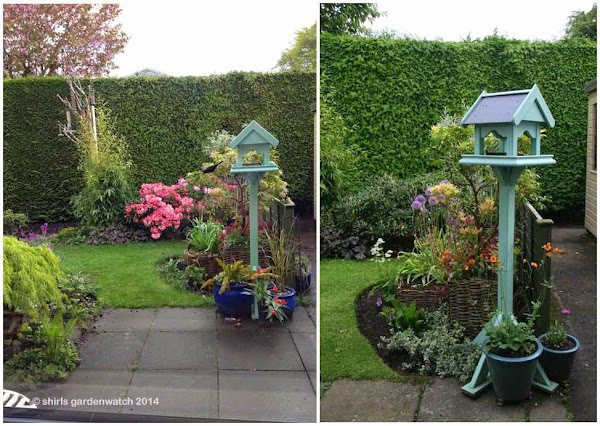 My bird table has blended beautifully into my summer garden at the same location as in winter with only just a couple of simple tweaks. The angle of the table was turned round (RH image below) to bring the base further into the basket border. Another brick was placed in the border to protect the base foot. 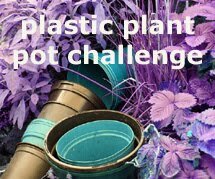 Changing the shape and colour of the pots decorating the base of my bird table was next. The border planting addition of the shrub Euonymus gave me my garden design fix too, adding light in a shady area and complimenting the colour of the bird table at the same time. As it grows, the Euonymus will scramble over the table base and up the planting basket becoming a pretty feature for my eye and a safety feature of ground cover for birds like the Dunnocks that scurry along the ground. 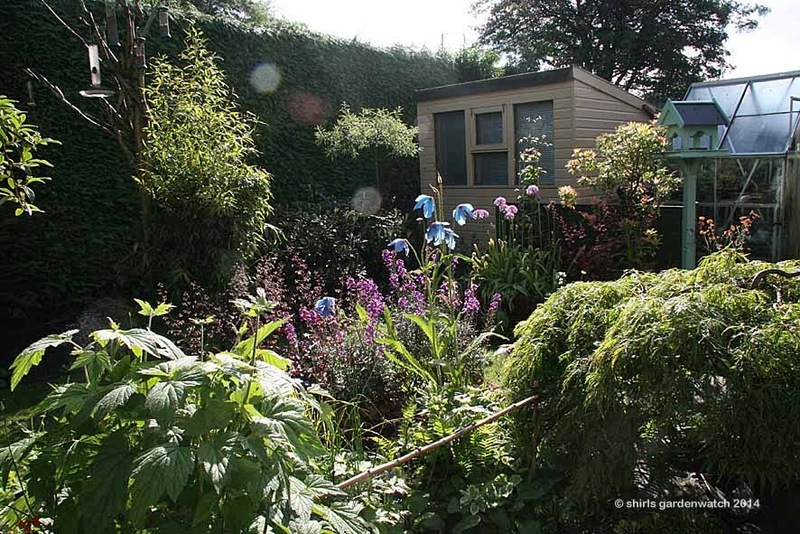 I do enjoy the fun challenge of tiny garden make-overs don't you? Being a plantswoman at heart, I have to admit to being a tad worried about the possible competition my colourful table could give the colours of my spring and summer flowering plants. Many are quite special to me like the blue Meconopsis poppy. Meanwhile, stepping forward with confidence and winning the competition on the bird table, a lot of the time, have been Wood Pigeons. They appear to have increased in numbers with visiting the wildlife pond this year. Up on the peanut feeders Jackdaws are regular visitors now resulting in less peanuts going past their best which is a good thing! 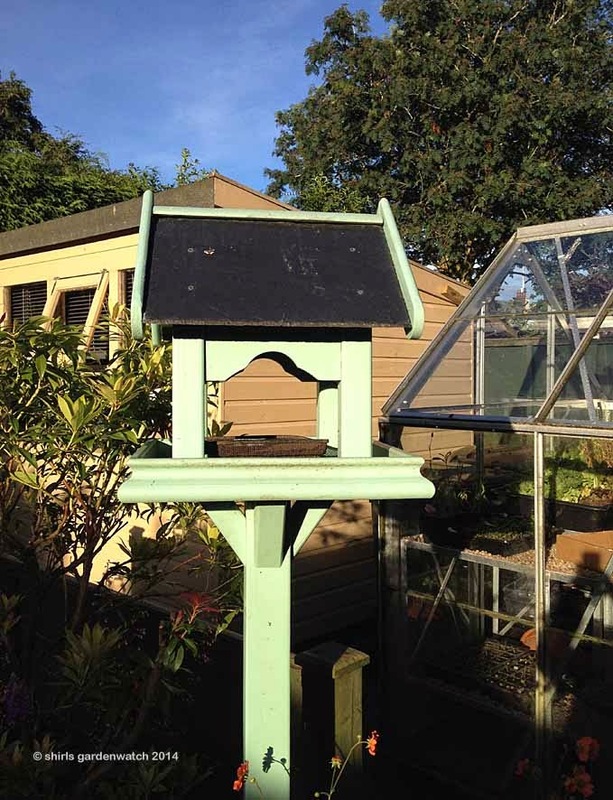 Recommending the addition of a bird table to a garden is easy – definitely! Seeing birds choose to land and feed there is such a privilege to see. Recommending the brightly coloured, stylish Buttermere bird table as a purchase or gift is easy too – yes, I have loved mine! 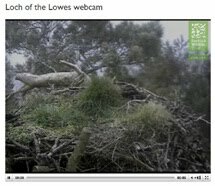 (Please note that the links to this bird table in my review blog are broken at present. I am unsure if this product is still available or the website is being redesigned). 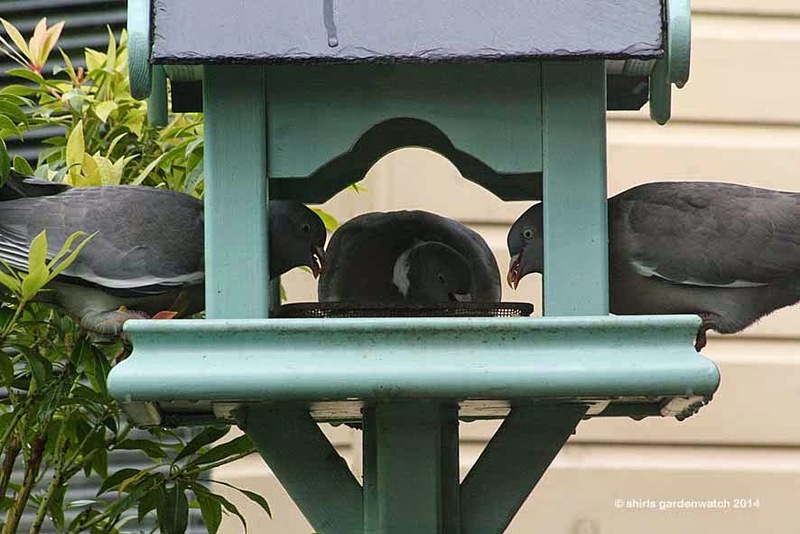 Views of smaller birds feeding can be seen in a previous wordless Wednesday post as can my original review of the buttermere bird table. 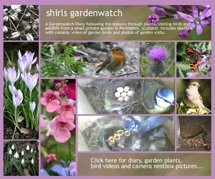 Copyright: Original post published on http://blog.shirlsgardenwatch.co.uk/ by blog author Shirley, November 22nd 2014. That is a superb bird table. I just have the B&Q one. It does the job. Martyn made our bird tables as we felt that the ones for sale had too small a feeding area and also the roof was too low, One of ours is within touching distance of the house but the birds don't seem to mind ans we have good close-up viewing. You have the perfect spot for such a bird table. I am afraid that I don't have a spot where one could sit without being anchored well to the ground. Winds here would blow them over. The wind can even blow over my umbrella when it is down and well anchored. 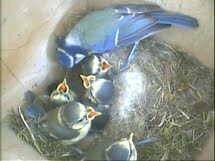 It is fun to see the birds that you have visiting your feeding area. I am green with envy that you can grow those blue poppies. They are a dream flower for me. Our area is too hot and dry for them. Anna, hello again :-) it is a pleasing colour and design isn’t it. Yep… that Meconopsis will always wow! A very smart looking birdy breakfast bar. I do like the slate roof. Can't think I have ever seen any coloured ones in local garden centres.